The watertower on the corner of Coral Sea Road and S.W. 200th street no longer exists. When I was a kid, despite it’s surrounding fence and padlocked gate, neighborhood kids still managed to climb and tag the tower. This tower tags my memories and is a beacon of a slower, simpler life. 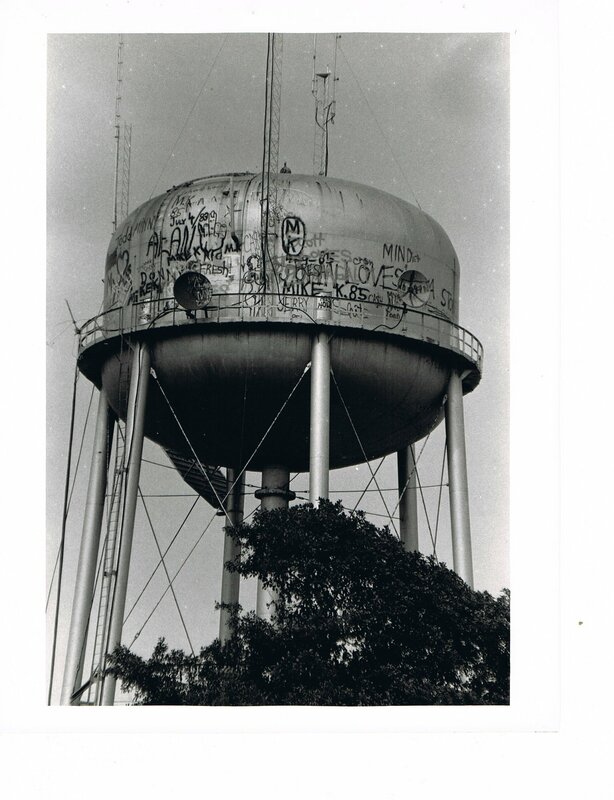 If I had my own penseive into which I could pour out my memories, this watertower would serve as a back drop. I walked to elementary everyday along the sidewalk across the street. I ran home from school across the playground and baseball field behind it every afternoon. I broke the glass filled Thermos in my Holly Hobby lunch box kicking it home in second grade after receiving my first bad grade from Mrs. Cohen. She passed back a spelling test and I had gotten a “C”. It was my first ever bad grade. While Mrs. Cohen was distracted, I went to the class bathroom (with my test) and promptly flushed it down the toilet. Which then overflowed and flooded both Mrs. Cohen’s class and Mrs. Milkey’s classroom next door. Both classes got a free afternoon on the playground while the janitor cleaned the rooms. I sat in utter dread knowing I had to go home and tell my mom about the bad grade AND flooding the two second grade classrooms. At the end of school, I walked to the edge of the playground beside the giant ficus tree and tossed my metal Holly Hobby lunch box as high into the air as I could. Then I KICKED that metal box all the way across the field behind the watertower, through the park’s parking lot, across the grassy area in front of the park pool and into the rock lined swale between the road and the sidewalk in front of my house. As I looked up the driveway, I knew my mother waited inside. I had a hand written note from Mrs. Cohen that I had to get signed which meant I had to fess up. I remember turning and looking back over my right shoulder at the watertower standing there like a sentinel, an overseer. There was no escape. I was busted. And now I had an “F” on the spelling test because of the toilet incident. The same water tower was also at the intersection my father came through on his way home from work. He drove a small hunter green MG roadster. Depending on how he came through that intersection, how he shifted gears coming down 20th Street, my mom could tell if he was in a bad mood. She would send us outside with the instructions to wait for my dad to whistle for us to come back home. Off we ran, out the heavy wooden front door, across the street into the park and towards the tot lot. Get lost and stay lost until the coast is clear. Nowadays, I want a park into which I can run and disappear for hours. I want a foot bridge with a crawl space underneath that none of the grown ups know about; where I can hide and be invisible. I want my 10-speed bike with the flipped up handle bars so I can ride and ride and ride for hours only coming home because the street lights came on. Except….nowadays, I am the grown up and there is no disappearing and there is no park or hidey-hole or watertower. Only in my memories and some days….like today….I wonder if any of it was real.